In 150 days, on February 1st, I will be flying to Ft. Lauderdale, the Cruise Capital of the Caribbean. The following day, I will be boarding the 2014 Atlantis winter cruise through the Caribbean. That means I have only 150 days to prepare for the cruise. This is not my first gay cruise. I went on the Halloween Mexico cruise in 2012. To prepare for that I managed to lose 25 pounds and get my body weight close to 200 pounds. 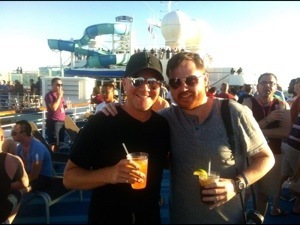 Me and my friend Marc on the Carnival Splendor as we departed the Long Beach Port. Almost a year after the cruise, I am taking this gay-cruising experience to the next level and continue my quest for a healthier, more fit and, yes, more attractive body. However, on top of just merely documenting what I am doing to my body and how I am changing it, I am also interested exploring why I am doing this to myself in the first place. Is it okay to be vain, to appreciate the stereotypical, athletic male body; and to desire to be that? Or is that sort of reverence and desire for the toned male body an intrinsically negative thing only causing self-hatred and low self-esteem? I am not so much interested in answering those two questions for the world and making a uniform prescription to solve the problem of gay male body image, as I am in exploring those two sides of the coin as they pertain to me and my unique gay male body. This blog is intended to be utterly self-indulgent (a bodyblog by its very nature must be!) When I make a statement or comment, I am not speaking for any community, but only for myself. I am not looking to solve any personal problem or societal problem, but simply explore my own relationship with my body as I transform it into what I perceive to be a gay ideal body. I am guessing the majority would pick 3. And I would like to move from 1 to 3. It’s utterly unscientific, presumptuous and offensive to suggest that the majority of gay men find this body type to be the ideal. I believe it is at least reasonable to suggest that is the reality, even if it is not a popular thing to say. So there, I said it, I want to be one of the lean, well-coiffed men. 150 days may not be enough time to transform my body completely, but I want to see how close I can get to this ideal. I want to exercise the discipline and restraint it takes to have a lean physique. What is it worth? What will it give me? How will I feel about myself in the end? Will it be worth the pain and sacrifice? Or will I even experience even cause me any sort of pain? How will I feel on the cruise? Will I be more self-confident? Will the positives outweigh the negatives? And so I begin 150 Days to see just how close I can get to this gay ideal.